Although you may refer to winter as the wet season with all the precipitation, the atmosphere is really more dry during the colder months, which often causes your eyes to be more sensitive. Our optometry staff is available to help you find the best ways to keep your eyes hydrated during the arid winter months. Even before you step outdoors you can prevent dryness by using a humidifier. Optometrists advocate using humidifiers in rooms with forced air heating, which can take away moisture from the environment. In addition, be careful to take extra precautions once you're going outside and will be exposed to the elements. You can further shield your eyes from the elements by putting on a brimmed hat and wearing sunglasses. Always try your best to shield your eyes from the whipping winds to stop them from drying out your eyes. If your symptoms become unbearable you may want to consider lubricating eye drops which may help treat the irritating symptoms of dry eyes. Speak to your eye doctor before you start using eye drops to confirm that they are the right solution for your condition. 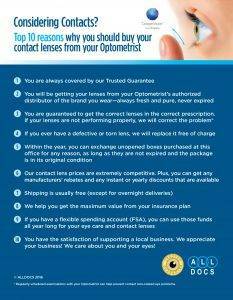 Remember that if you wear contact lenses you need to be particularly cautious in the colder months. If able, make use of rewetting drops as often as you can. Lenses are like sponges and need to remain wet to retain their shape. Once they loose moisture, the lenses can change form and cling to your eyes, which causes pain and blurriness. So do your eyes a favor and keep them lubricated this winter. With a little awareness and planning, you can stay clear of the dangers of the cold, dry weather and keep your eyes safe and cozy all season long!